Microscopically, all gray irons contain flake graphite dispersed in a silicon-iron matrix. How much graphite is present, the length of the flakes and how they are distributed in the matrix directly influence the properties of the iron. The basic strength and hardness of the iron is provided by the metallic matrix in which the graphite occurs. The properties of the metallic matrix can range from those of a soft, low carbon steel to those of hardened, high carbon steel. The matrix can be entirely ferrite for maximum machinability but the iron will have reduced wear resistance and strength. An entirely pearlitic matrix is characteristic of high strength gray irons, and many castings are produced with a matrix microstructure of both ferrite and pearlite to obtain intermediate hardness and strength. Alloy additions and/or heat treatment can be used to produce gray iron with very fine pearlite or with an acicular matrix structure. 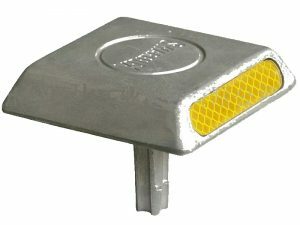 The ability to produce sound of aluminum die casting economically in complex shapes such as water cooled engine blocks. Good machinability even at wear resisting hardness levels and without burring. Dimensional stability under differential heating such as in brake drums and disks. High vibration damping as in power transmission cases. Borderline lubrication retention as in internal combustion engine cylinders. The properties of gray iron are primarily dependent on its composition. The lower strength grades of gray iron can be consistently produced by simply selecting the proper melting stock. Iron castings in the higher strength grades require close control of their processing as well as their composition. This equation indicates the relative amount of the eutectic that forms during solidification of the iron with 4.3% as 100% eutectic composition. This equation also, in effect, indicates that on the basis of percent by weight, the silicon and phosphorous contents of gray iron influence its tensile properties in the same manner as its total carbon content but only by one third as much. Other characteristics such as thermal shock resistance and properties in the foundry do not follow this relationship. Gray irons can be alloyed to increase their strength and hardness as cast or to increase their response to hardening by heat treatment. Gray iron can be annealed to a low hardness to increase machinability. Of course, this also decreases its strength. A very important influence on the properties of gray iron is the effective thickness of the section in which it is cast. The thicker the metal in the casting and the more compact the casting, the slower the liquid metal will solidify and cool in the mold. As with all metals, slower solidification causes a larger grain size to form during solidification. In gray iron, slower solidification produces a larger graphite flake size. The cooling of a casting from red heat is in effect a heat treatment. A slower cooling of the casting will produce a lower hardness in the metallic matrix. Alternately, iron that is cast into a section that is too thin will solidify very rapidly and can be file hard. A casting with separate sections that are appreciably different in thickness can have differences in graphite size and matrix hardness between the thick and thin sections even though the entire casting was poured with the same iron. These differences in structure produce differences in mechanical properties. Gray irons are commonly classified by their minimum tensile strength. A class 30 gray iron indicates that it has a nominal tensile strength of 30,000 psi. In the International Standard or Sl System a similar iron would be grade 220 with a tensile strength of 220 MPa (megapascals) or 220 newtons per square millimeter. A class designation may be used to indicate a grade of iron even when tensile strength is not an important consideration and may not be specified or tested. However, when the class designation is used in conjunction with a standard specification that requires a minimum tensile strength, then actual tensile tests are made to determine if the metal meets this requirement. In a particular size or type of die casting, gray irons can also be satisfactorily designated by their Brinell hardness, (see Table 2). This designation has the advantage of using a nondestructive test that can be applied in routine inspection. These methods of designation are satisfactory for most applications because the common engineering properties of gray iron can be related to its strength and hardness. The chemical composition of gray iron is not commonly specified because it does not assure obtaining specific mechanical properties. However, for special applications some aspect of chemical composition may be specified to assure the suitability of the iron for a specific need. For example, an alloy content range may be specified to assure an adequate response to heat treatment or to provide strength or oxidization resistance in service at a red heat. A minimum carbon content may be specified to provide adequate thermal shock resistance. Hardness is the most commonly determined property of metal because it is a simple test and many of the useful properties of metal are directly related to its hardness. Within a class or type of gray iron, hardness is a good indicator of its engineering properties, but this relation is not useful between types of gray iron because differences in graphite structure have more of an effect on tensile properties than on hardness. 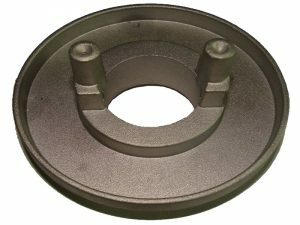 Specifying the hardness at a designated place on each casting is an excellent method of establishing consistency of castings in production quantities where the type of iron being used has been established as satisfactory for the application. Compression strength does correlate very well with hardness for all types of iron because hardness is essentially a compression test. Hardness usually gives a good indication of tool life in machining, however, the presence of free carbides in the microstructure will reduce the machinability much more than it increases the hardness. The typical hardness ranges available in gray iron are listed in Table 3. The Brinell hardness test is used for all irons because the Brinell test impression is large enough to average the hardness of the constituents in the microstructure. Rockwell hardness B or C scale tests can be used satisfactorily on machined surfaces where the supporting surface is also machined. Several Rockwell tests should be made and averaged, but extreme values should be discarded because of inordinate influence by a graphite flake or a hard constituent. A conversion chart between Rockwell and Brinell hardness values can be used accurately for steel but deviations from this relation for steel occur with gray irons. This deviation increases with high carbon equivalent irons. The amount of flake graphite present influences the two tests differently. This is evident from a comparison of microhardness test results on the matrix of gray irons compared to standard Rockwell C values on the same irons. The microhardness impressions do not include the graphite flakes that are present under the Rockwell C hardness indenter. For this reason the hardness of gray iron should not be compared directly to the hardness of other metals for an indication of properties such as machinability or wear resistance. However, some effective hardness conversions can be made between selective types of hardnesses. The hardness is affected by the processing of the gray iron as well as the composition because these factors influence the microstructure. Hardness is also related to other properties of gray iron as described in the following sections. The mechanical properties of gray iron are determined by the combined effect of its chemical composition, processing technique in the foundry, and the solidification and cooling rates. 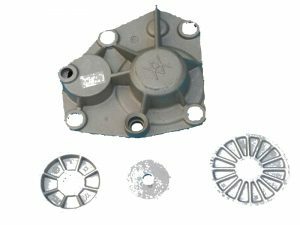 Thus, the mechanical properties of the metal in a casting will depend on its shape, size and wall thickness as well as on the iron that is used to pour it. The tensile strength of gray iron is influenced by both the normal elements present in plain irons such as carbon, silicon, phosphorus, sulfur and manganese, and the presence of alloying additions and trace elements. Carbon and silicon are very important elements and are combined, usually with phosphorus, in a carbon equivalent expression. Irons with a carbon equivalent of more than 4.3 are hypereutectic and usually contain coarse graphite. They are of lower strength, but are excellent in thermal shock applications and for vibration damping. Gray irons with less than 4.3 carbon equivalent are hypoeutectic and of higher strength because the amount and size of the graphite flakes decrease with the CE value. The effect of higher carbon equivalent is to reduce strength because of the formation of larger amounts of coarser graphite and, commonly, more ferrite. Manganese, sulfur and phosphorus are present in plain gray irons and influence the tensile strength to some extent. Sulfur is a very significant element because it exerts marked effects on the solidification behavior of iron. For this reason, the sulfur content in iron is usually controlled within limits and with a selected ratio to the manganese content since sulfur combines chemically with manganese to form manganese sulfide. The minimum manganese content in iron is generally 1.7 times the sulfur content plus 0.12% manganese. This assures sufficient manganese so that all of the sulfur is combined with manganese rather than with iron. Manganese in excess of this amount is a mild carbide stabilizer, refining the pearlite and increasing the hardness and tensile strength. An excess of manganese or phosphorus can cause dispersed internal porosity in heavier sections such as bosses. For this reason, phosphorous is kept as low as practical except for special purpose irons. Increasing phosphorus provides a somewhat higher tensile strength, but contents over 0.20% reduces machinability particularly in drilling operations. Metals which are subjected to repeated or fluctuating loads, such as alternating between tension and compression, can break after a large number of loading cycles even though the maximum stress was well below the static strength of the metal. This type of fracture is called a fatigue failure, although the rate of load application or the length of time over which the cycles occur are not significant. The occurrence of a fatigue crack is directly influenced by the maximum unit stress and the cumulative number of times it is applied. A fatigue crack starts in an area of high stress concentration after a large number of loading cycles. It is always a brittle type of fracture even when occurring in ductile metals. As the crack progresses, it increases the stress concentration, and the rate of propagation under the cyclic loading increases. When the cross section of the remaining metal becomes insufficient to support the maximum load, complete failure occurs as it would under an excessive steady stress. The number of stress applications that will induce a fatigue failure is less at higher maximum stress values, and conversely a larger number of stress cycles can occur at a lower maximum stress level before a fatigue crack is initiated. When the number of cycles without failure exceeds 10 million, the endurance life is considered infinite for body-centered-cubic ferrous metals. The maximum stress that will allow this number of cycles is established as the endurance limit, or the fatigue strength or fatigue limit. The relative ability of a material to absorb vibration is evaluated as its damping capacity. The quelling of vibration by converting the mechanical energy into heat can be very important in structures and in devices with moving parts. 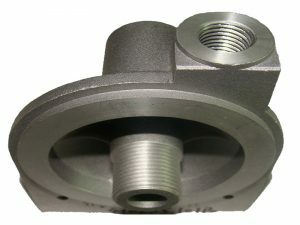 Components made of materials with a high damping capacity can reduce noise such as chatter, ringing and squealing, and also minimize the level of applied stresses. Vibration can be critical in machinery and can cause unsatisfactory operation or even failure. An accumulation of vibrational energy without adequate dissipation can result in an increasing amplitude of vibration. Excessive vibration can result in inaccuracy in precision machinery and in excessive wear on gear teeth and bearings. Mating surfaces normally considered in steady contact can be caused to fret by vibration. 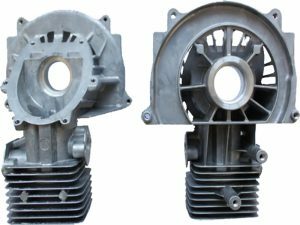 The exceptionally high damping capacity of gray die casting iron is one of the most valuable qualities of this material. For this reason it is ideally suited for machine bases and supports, engine cylinder blocks and brake components. The damping capacity of gray iron is considerably greater than that of steel or other kinds of iron. This behavior is attributed to the flake graphite structure of the gray iron, along with its unique stress-strain characteristics. The relative damping capacity of several different metals is illustrated in Table 4. Damping capacity decreases with increasing strength since the larger amount of graphite present in the lower strength irons increases the energy absorbed. Larger cast section thicknesses increase damping capacity and inoculation usually decreases it. Heat treating can also have an appreciable effect on damping capacity. The fracture toughness of a material is a measure of the work required to fracture it. This required work is related to the material’s resistance to crack initiation and growth. The work or energy dissipated in fracturing a material is associated with the elastic and plastic deformation of the material and/or crazing (microcracking) that precedes final fracture. The fracture toughness will generally vary with temperature, state of stress and strain-rate, all of which influence the amount of deformation which precedes fracture.